The K-01’s 16.28-million-pixel, APS-C-sized (23.7×15.7mm) CMOS sensor has been used a number of times in the past, in various different guises. It is the same sensor as that found in the Pentax K-5 and, being a Sony-made unit, it is also present in the Alpha 55, Alpha 57 and NEX-5N, as well as in the Nikon D7000. This sensor has performed extremely well in all these cameras, particularly in low light, producing minimal noise, a good dynamic range and excellent recovery of shadow detail. Removing the reflex mechanism from a camera has a significant impact on its design and performance. With the K-01, the most obvious change is the lack of an optical viewfinder yet no option for fitting an electronic viewfinder, but more on this later. 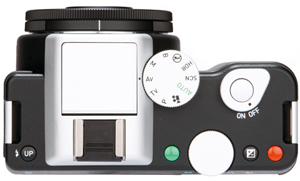 There is also no phase-detection AF system, so like most compact system cameras the K-01 relies on contrast detection. The range of metering and exposure modes available on the K-01 will be familiar to DSLR users, as this camera has a full complement of manual exposure modes and a variety of scene options. Evaluative, centreweighted and spot metering modes are on hand to help photographers get a correctly exposed image. As the electronics of the camera are similar to those of the K-5, most of the capabilities of that camera are also present in the K-01. The new camera shoots both raw and JPEG images, has built-in image stabilisation, a multi-exposure mode, interval timer and HDR capture mode. The K mount, around which the K-01 is designed, has been used in Pentax SLR cameras since 1975, so there are hundreds of different lenses that are available for use with the K-01 and, for that matter, the company’s current DSLR range. This should be one of the biggest selling points for the K-01, as many photographers will have old Pentax lenses lurking in cupboards waiting to be given a new lease of life. The firm’s current range of AF lenses is also very comprehensive, and Pentax has even created a new optic to complement the K-01 – an unbelievably thin 40mm f/2.8 pancake lens.